Warning buzzers may sound from inside or/ and outside the vehicle to remind you that the keyless access remote is out of the vehicle. If the buzzer continues even after the remote is put back inside, place it to be within its operational range. If the keyless access remote is taken out of the vehicle, and the driver’s door is closed, warning buzzers sound from both inside and outside the vehicle. A warning message on the multi-information display notifies the driver inside that the remote is out. If the keyless access remote is taken out of the vehicle, and the driver’s door is closed, a warning buzzer sounds from outside the vehicle. When the keyless access remote is within the system’s operational range, and the driver’s door is closed, the warning function cancels. If the keyless access remote is taken out of the vehicle after the engine has been started, you can no longer change the ENGINE START/STOP button mode or restart the engine. Always make sure if the remote is in your vehicle when you operate the ENGINE START/STOP button. 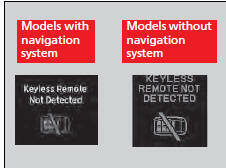 Removing the keyless access remote from the vehicle through a window does not activate the warning buzzer. Do not put the keyless access remote on the dashboard or in the glove box. It may cause the warning buzzer to go off. Under some other conditions that can prevent the vehicle from locating the remote, the warning buzzer may also go off even if the remote is within the system’s operational range.